It's almost becoming trite to bring up Evgeni Malkin with each Penguins' win. The Pens have rallied in the absence of their star centerman to play arguably their best hockey of the season, and they manhandled the Washington Capitals en route to a 6-2 blowout win. It's the team's 6th win in a row, and it's helped to vault them into a tie with the New York Rangers for 2nd place in the Metropolitan Division with identical 40-24-8 records. Tom Kuhnhackl had a goal and 2 assists on some great individual efforts, and Sidney Crosby added 2 assists to extend his point streak to a season high 12 games. The Penguins showed signs of being the team that had played yesterday as Washington pressure early in the game and easily could have taken the lead with several good scoring chances that Marc-Andre Fleury was able to turn away. But despite the play tilting into the Pittsburgh end during the first half of the 1st period, it was the Penguins who would get on the board first. On a rush originating from in front of the Pittsburgh crease, Tom Kuhnhackl made a great turning pass to find Bryan Rust behind the defense, and Rust cut across the crease the wrap the puck around Braden Holtby and make it 1-0 Pittsburgh. Just 1:26 after the Rust goal it would be the Pens striking yet again to completely neutralize what appeared to be an early Capitals advantage in the gameplay. Sidney Crosby found Trevor Daley driving the shot, and Daley made an incredible individual effort to kick the pass to his skate then backhand the puck short side on Holtby to give the Pens the 2-0 lead midway through the 1st. After a Daniel Winnik interference penalty with 8 minutes remaining in the period, the Penguins had a great chance to put the dagger in the Capitals heart by extending the lead to 3, but the Washington penalty kill was able to keep the puck deep in the Pittsburgh zone for much of the man advantage to prevent the Pens from capitalizing. They would take another penalty later in the period on a TJ Oshie trip against Chris Kunitz, but again the Capitals were able to shut down the struggling Pittsburgh power play. The Pens had a great chance for a goal on some nice tic-tac-toe cross ice passing when Crosby hit Phil Kessel, who immediately found Nick Bonino on the backdoor for a one timer, but Holtby was able to track the play well enough to get over and make the stop. The horn would sound to start the first intermission with the Pens ahead 2-0, and Pittsburgh had to like how the 1st period turned out on the scoreboard. The Capitals would need to turn things around in the 2nd period, and they were able to do so just 1:18 into the period on a fluky play. The puck was flipped into the Pittsburgh zone where Jason Chimera and Trevor Daley chased after it. Chimera got position on Daley, and Marc-Andre Fleury poke-checked the puck away. But the puck ricocheted off Chimera's head and over Fleury into the net to cut the lead to 2-1. A lengthy discussion would ensure, but the goal was ultimately upheld. The Capitals would get a great chance to pull even shortly after as they got a 3-on-1 rush against Ian Cole, but Cole made a great play to break up Chimera's pass and Fleury gloved the puck as he floated up in the air. The Penguins wouldn't be out of the woods quite so easily, as Cole would take a holding the stick penalty against Jay Beagle not long after stopping the Washington rush to put the Capitals' top ranked power play on the ice for the first time. The Penguins got a great chance midway through the opportunity with a 2-on-1 rush shorthanded, but even though Daley got the puck in alone against Holtby he wasn't able to beat the Caps' goalie. It would prove to be the best scoring chance of the penalty, and Cole exited the box to bring the teams back to even strength with the Penguins still up 2-1. The Capitals continued to build on the momentum that they had seized during the first half of the 2nd period, and it began to seem eminent that they would be able to get the next goal on the board to even the score. The pace of the play began to quicken with both teams trading rushed up and down the ice, but neither team was able to beat the other goaltender until Mike Weber shoved Bryan Rust into the Capitals net and pummeled him while there, prompting the two to exchange punches. Rust would get a roughing minor for his role in the scrap, while Weber would get a double minor for roughing to give the Penguins a power play. Unfortunately for Pittsburgh, Sidney Crosby would be robbed of a power play goal to make it 3-1 when the ref lost track of the loose puck and blew the play dead before Crosby was able to put it home. After the stoppage in play, the teams would get into another scrum behind the Washington net. Apparently feeling zero regret for royally screwing the Penguins out of a goal, the refs assessed double minors on both Oshie and Patric Hornqvist, and the Pens' 5-on-4 advantage continued. Further compounding Pittsburgh's bad luck at the hands of the referees was that Andrea Burakovsky scored on a shorthanded breakaway to turn what should've been a 3-1 Pittsburgh lead into a 2-2 tie game. Flashing the resiliency they've shown under Mike Sullivan, the Pens made sure they didn't lose the lead for long, and it was Kuhnhackl slapping a one-timer from the right circle past Holtby's glove on the near side for his second point of the game to regain the lead at 3-2. 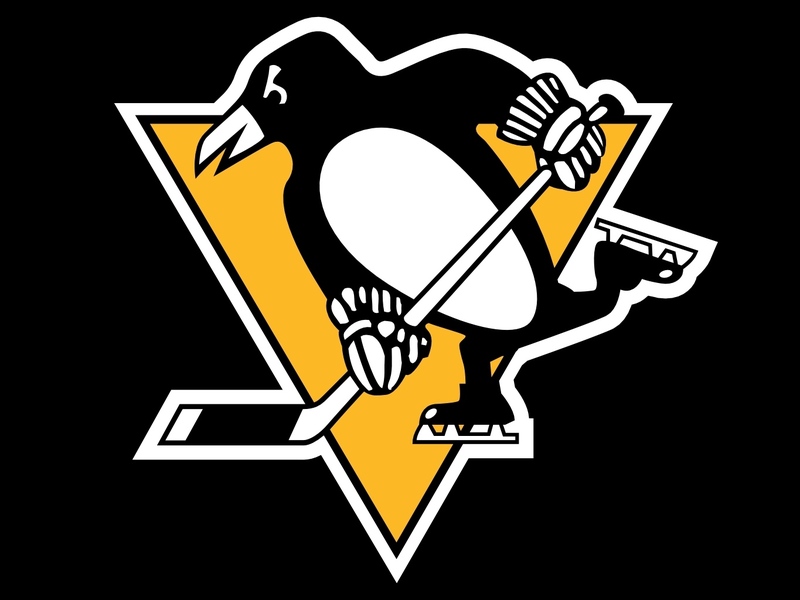 The Penguins would have a chance to build the lead back up to two before the end of the period as Justin Williams was called for high-sticking Carl Hagelin with 1:52 left in the 2nd period, but the Capitals' PK held firm and the game entered the second intermission 3-2 Pittsburgh. It would be important for the Penguins to withstand any pressure Washington was able to generate at the start of the 3rd period, but it was Matt Cullen who was able to extend the lead to 4-2 minutes into the period. Cullen took the puck in on the breakaway, and while he didn't manage to beat Holtby cleanly the puck flipped up into the air and landed on Holtby's back before trickling across the goal line. It was a huge goal to give Pittsburgh some breathing room down the stretch, and Justin Schultz nearly extended the Pens' lead to three moments later when he beat Holtby from the right circle, but his shot squarely hit the left post and caromed back out. Midway through the period, Kris Letang flipped a puck into the offensive zone that Crosby was able to chase down, and he fed the puck cross ice to Chris Kunitz, who was able to beat Holtby for the team's 5th goal of the evening. It was enough for Barry Trotz, who pulled Holtby for Philip Grubauer for the remainder of the game. With the goal extending the Pittsburgh lead to 3, the Pens could turn their focus to trying to run out the clock and leave the game unscathed, but on the very next shift Alexander Ovechkin hammered Brian Dumoulin in the corner, with Dumoulin falling to the ice in obvious pain. Not long after, Mike Weber blatantly boarded Rust on a dangerous play that should be subject to supplementary discipline. Rust was okay, and Weber received a 5 minute major and 10 minute misconduct, while Kuhnhackl received a 2 minute minor and 10 minute misconduct for sticking up for his teammate. The teams would play 4-on-4 for two minutes before the Penguins would get an extended power play opportunity. Justin Schultz would tack on his 1st goal as a Pittsburgh Penguin when he slapped a one-timer that beat Grubauer on the far side to make it 6-2. The final minutes would feature a pair of penalties, but at that point both teams were looking to move onto the next game. 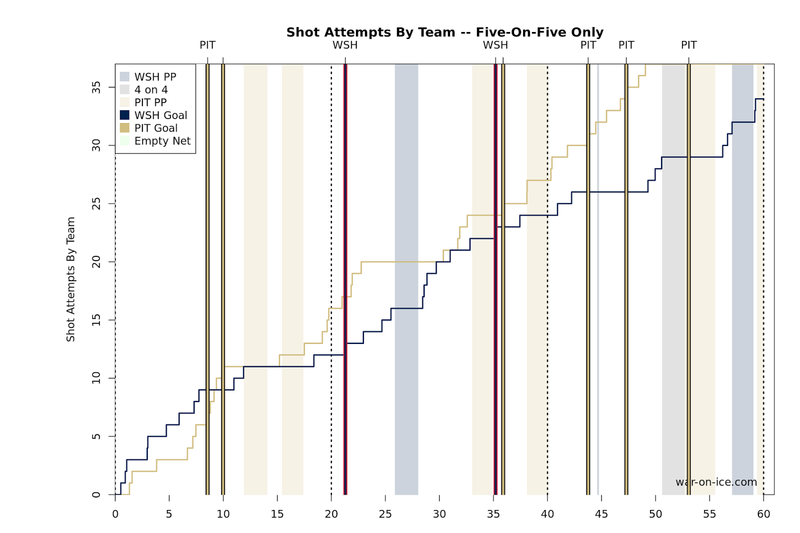 The Penguins entered the game with a decent-sized advantage in the possession game over the Capitals, and the gameplay mirrored that advantage as they went on to post a score-adjusted 54.6 CF%. It was a dominant win for a team hitting their stride at exactly the right time of the year. The Pens will get a much needed rest following this game, as they won't be back in action until Thursday against the New Jersey Devils. They are playing great hockey and jelling at the right time. Speed Kills ! But without Malkin the PP is useless . Going to need the PP in the Playoffs .